Hey, everybody. We have lots of cool Pillars of Eternity news for you today. Everything from our Update 3.0 Beta to a last chance to get your very own copy of Lords of the Eastern Reach. Last chance at Lords of the Eastern Reach! As most of you know, Lords of the Eastern Reach is a card game from Zero Radius Games that is based on the Pillars of Eternity license. The game had a successful Kickstarter last year and Zero Radius Games is about to send the game for printing. If you didn't get a chance to put in an order, but want to get your hands on the game in the near future, there is still time. Just head over to its Backer Portal and make a pledge! Even better, if you already have an account made for the Pillars of Eternity Backer Portal it will work with the Lords of the Eastern Reach portal. In preparation for The White March - Part II launching next month we are putting out a 3.0 Beta on Steam. 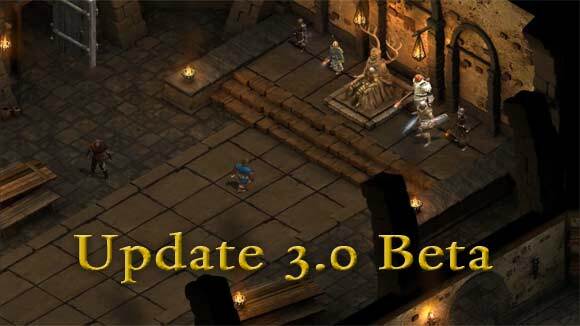 The 3.0 Update comes with a ton of changes, bug fixes, and new features. We need your help in looking over everything to make sure that the community is happy with the direction of some of these changes. If you are able, we would really appreciate that you opt into the Beta patch and supply feedback in our forums. As always, you guys are what helps to make Pillars of Eternity the best game it can be. The value/feeling of Athletics and Survival, both on their own and relative to other skills. Do any of the Survival bonuses feel way out of line with the other bonuses? How do Knockout Injuries feel? Are they too punishing? Not punishing enough? Do any injuries feel way out of line with other injuries? Assuming you like the idea of Story Time, how does it feel to you? Does it make the game more enjoyable for you, or does it just remove combat as an obstacle that you didn't like in the first place? Do you like the new Stronghold Adventures? Do you like the narrative elements of them? How do the unique items you get from them feel? Do any of the unique items seem out of line with other items considering their relative difficulty level (i.e., comparing Minor to Minor, Grand to Grand)? Do you like the presentation and content of the Stronghold Visitor Dilemmas? How do you feel about the setup of the scenes? Are there any dilemmas that you don't like? Do you feel like the dilemmas all give you a good range of options for resolving them? Does the combat in the last third of the main game (from Elmshore on) feel better? Specifically, have we removed enough battles that feel like trash mobs or filler? Have we improved the fights there so they are a) challenging and b) more interesting? The same question, but on levels 7, 8, and 11 of the Endless Paths of Od Nua. For a more in-depth look at some of the changes and fixes, head over here and check it out. Hey, modders! Have you been looking for an easier way to translate Pillars of Eternity into different languages? The Obsidian Tools Localization Builder is the answer. With the Localization Builder you can quickly and easily translate Pillars of Eternity and The White March just like we do here at Obsidian. To get more information about the Localization Builder watch the video below. 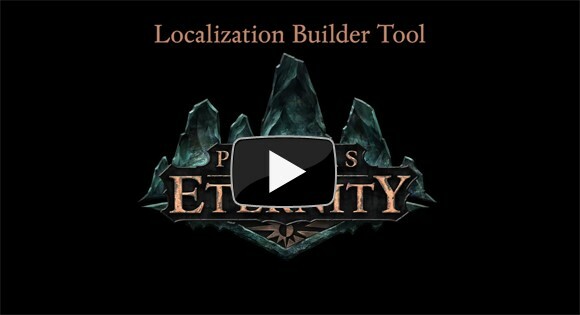 This video will tell you a bit about the Localization Builder and explain how to set it up. Note: The Localization Builder requires a legitimate copy of Excel to work correctly. If you use a pirated version it may not work properly. Note: It is also for Windows only. We have no plans on making OSX or Linux versions for the future. You can download the Localization Builder here. You can download the associated Excel files here. With the release of our Localization Builder, the Eternity team wanted to showcase some of the unofficial fan translations for Pillars of Eternity. Everyone here at Obsidian really appreciates the hard work that you guys put in to spread the game to as many people as possible. If people would like to assist in getting more translation fixes in, they can post here on the forums. If you would like to perform translations in new languages you can use the Obsidian Tools Localization Builder. Just check out the video above. That's it for this update. Our next update will be about Pillars of Eternity's latest companion, Maneha. Now I'm feeling a twinge of regret at having gone with GoG rather than Steam. Would be quite curious to check out and give feedback on these changes... Oh well, gods-speed to the rest of you! That said, a question to Obs--why the Constant Recovery nerf? It had already been nerfed from "all the time" to 90s; now that it is 45s it could easily be absent and hardly anyone would feel the difference. Would rather have it scale in duration and/or magnitude with level. What's the Process called so I can close it without having to restart my computer? Edited by Osvir, 22 January 2016 - 10:58 AM. Hey, Osvir. It does require Excel to work correctly. Should just be LocBuilder.exe. Couldn't able to open the '.xlsx' format with the latest version of the Open Office. I was able to convert xlsx to xls (which OpenOffice has no problem opening) but of course the 'Loc Builder' wont recognise that format. So is there a way to do or are there going to be support for different ( but popular) Office programs? I hope Dev team can clear that up couse I want to start as soon as I can. Edited by ruzen, 22 January 2016 - 03:26 PM. If you use a pirated version it may not work properly. As active localisation improver i can very much life with the Stringtable files. The only thing we did not have directly at hand right now is the information who says what. Oh, and remind you, i released a updated translation for German yesterday! I would add the Cipher nerf to the list of unwarranted changes alongside the Constant Recovery nerf. I don't recall anyone complaining about Ciphers after the last nerf, so why do it? "Time Parasite" was bad enough with a cost of 40 Focus, because it lasted too short to be worth my while (enemies aren't generally speedy enough to make me want to debuff their recovery; to boost mine, a Potion of Deleterious Alacrity of Motion is superior because it lasts longer.) At 70 Focus (a massive 30 increase!! ), I would never even consider it. This was a very big change that feels completely uncalled for. Why? EDIT: nvm, Josh answered on SA. As the level cap continued increasing, the max Focus cap outpaced the increase in cipher power cost by an increasingly wide margin until it became both very easy to start combat with really strong powers and very easy to regain enough Focus to immediately use those strong powers -- sometimes multiple times in sequence. The goal of the "non-traditional" resource characters (ciphers, monks, and chanters) has always been that the majority of powers are not restricted to times per encounter or times per rest, but to a resource that requires time to pass/things to occur within combat. If little or no time is actually required for these classes to use their most powerful abilities in rapid succession, there's not really a trade-off. I'll reserve judgment until I play with the changes, but I'm still weary of them because of their magnitude. Edited by AndreaColombo, 23 January 2016 - 12:58 AM. I'm liking the changes to survival and athletics. The camping bonuses do feel valuable (even potent.... 4 points of DR, for example, seems like a lot, but I have no idea how much damage 15+ level opponents will deal, and the same could be said of the rest of the bonuses ), and I love the "accuracy bonus vs creature type" option, it makes the character who invests in Survival feel very...rangery, as it feels very reminiscent of D&D's "favored enemy". Athletics looks good as well, and is now worth increasing past 3, since the extra heal can end up being quite noticeable. From a balance standpoint I'm not sure how much impact these changes will have, but, in the end, the bonuses aren't free and there's an opportunity cost involved ( my party used to just invest heavily in Lore and Stealth instead, and I don't really either Survival or Athletics are as valuable as Lore, while Stealth retains its strategic value ); the only skill that seems to have fallen behind, unless I'm missing something, is mechanics, since you really don't need more than one party member focusing on it, presently. I'm not sure this is a problem, though. Constant/Veteran/Rapid Recovery: Veteran and Rapid do seem to scale with level now, but, in my game at least, Constant Recovery seems to be now a fixed 5/tick instead of scaling. Is this intended? Do you need to invest in Rapid Recovery for the scaling? Right now, Constant Recovery seems to be worse than Veteran's Recovery at level 14. Also, with the increase in magnitude of the ticks the chance of overhealing has increased as well. Shades, spectres and so forth are both immune to "prone" and "ground" effects, instead of only being immune to "prone" as per patch notes. Also, there's something weird going on with accuracy: my 14th level fighter's character sheet breaks down his accuracy as follows: "+25 fighter, +1 perception, +39 level", while my newly created 13th level mercenary has "+30 fighter, +36 level". My ranger's Character sheet puts him at "+23 Ranger, +36 level", and, later, at "+18 Ranger, +36 level", and Zahua's accuracy breakdown, again, shows "+25 Monk, +39 level, +15 transcendent suffering 4". it was nothing game changing, but did feel like a nice, worthwhile addition to the game. Edit: yeah, I also think the Cipher nerf was unwarranted. Edited by Njall, 23 January 2016 - 01:52 AM. Edited by AndreaColombo, 23 January 2016 - 02:18 AM. I've noted this on the beta forum as well but I think that Second Wind just adds more micro to combat. I also think that some of the survival bonuses cross over into athletics territory (otherwise a great change). Maybe both Athletics and Survival could have a list of per rest bonuses to pick from? So, anyone knows how does Brisk Recitation work and scale excatly ? I've been very curious about it ! And happy new year 2016 to everybody on this forum ! Brisk Recitation reduces phrase recitation time by 10% at level 4, when you first get it. Every 3 levels, you get another -10% ( so it's -20% at level 7, -30% at level 10, -40% at 13th and so forth ). Also, it seems that they took the time to buff quite a bit of the less used multiclass talent; many are now usable per encounter, rather than per rest, and some have better effects ( like outlander's frenzy, which is still per rest but also increases your might and constitution by 3 aside from increasing attack speed ) or scale with level (Acolyte's Radiance). Edited by Njall, 23 January 2016 - 05:59 AM. EDIT: Does Brisk Recitation increase linger length by the same amount the recitation time is reduced? E.g. If a phrase has a recitation time of, say, 4 seconds and a linger of 4 seconds for a total of 8—does Brisk Recitation change it to, e.g., 3.6 seconds recitation, 4.4 seconds linger so as to maintain the total duration of 8 seconds? Edited by AndreaColombo, 23 January 2016 - 06:16 AM. Is it too late to hope for a change? Maybe they'll hear our voices! I've also been thinking about that skill many times: nerf it a bit and make it per-encounter? Pretty please? My bad, I didn't remember it also increased might and constitution. As you say, as a per-rest ability it's nothing to cry home about, so I didn't end up grabbing it often ( if ever ). As for brisk recitation, it doesn't look like it interacts with linger, it only seems to affect recitation. Edited by Njall, 23 January 2016 - 07:11 AM. Weird, considering it is not optional. So it's basically a nerf to your chants' overall duration (which tangentially works counter your bonus from INT) in exchange for faster spellcasting? So it seems, yes. It's weird, but I'm not sure how increasing linger time might affect balance, since you're reciting much faster and, aside from generating more phrases, you're also buffing your party much more frequently. Edited by Njall, 23 January 2016 - 07:35 AM.